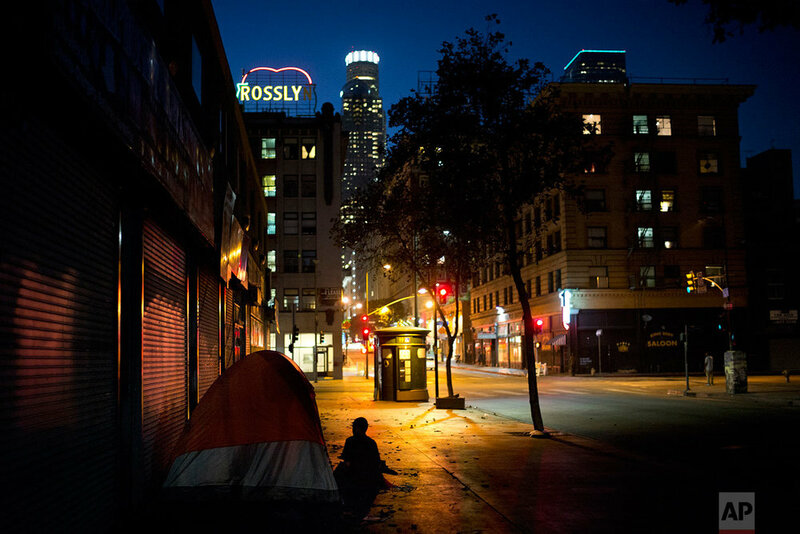 I was drawn to document life on Skid Row after being repulsed by it. Initially, it wasn’t to bring awareness to the plight of the people there or to give voice to the homeless. It was more of a visual curiosity. Tents were dwarfed by multimillion-dollar buildings. People were shooting heroin and smoking crack in broad daylight. A mentally-ill woman was screaming and cursing as if seeing a ghost. My first encounter with this square mile of misery nearly a decade ago remains a vivid memory. I passed through in my car and double-checked to make sure my doors were locked and windows rolled up tight. It wasn’t fear; it was shock. When I returned a couple years later, I was on foot with my camera. I had to experience, the sights, sounds and smells up close. The project to document the homeless crisis on the West Coast began in late August. Except for a few days covering Northern California wildfires and the World Series, this is all I did for nearly three months. I walked a lot and talked to a lot of people. Many generously told me their stories. Some were clearly high or crazy. Others were scary. People cursed me inches from my face, spittle flying from their mouths. A woman living on Skid Row warned me that no one would kill me on Skid Row because they didn’t want trouble with the police, but they might rough me up. I saw so much of people in their rawest moments that I couldn’t bring myself to take photos of some of it. I dialed 911 four times to get help for people. One was a drug addict passed out in the middle of a street intersection on Skid Row. Another was a naked woman in a tree in Santa Ana talking to herself in Spanish. There’s always an internal struggle. As a photographer, I want to capture the moment because my job is to tell the story. As a human, the agony can be too hard to watch. Some don’t know they need help or that help exists. I have sympathy for the poor. I don’t judge them now that I’ve seen so many people in dire situations from different circumstances and have heard about their lives. Many times I’ve tried to comfort them with encouraging words. I wish I understood the problem of homelessness better than before. Truth is I’m more confused than ever. I can’t see a solution. I made plenty of mistakes growing up. We all did. But my parents loved me and supported me. My mother even gave up her job as a school teacher in South Korea so my brother and I could study in the U.S. How many on Skid Row had that luxury? I now live in a two-bedroom condo in a gated community. The refrigerator is full of food. There’s a hot shower and comfortable bed. Skid Row is like a planet of its own. I’m just orbiting it as an observer. 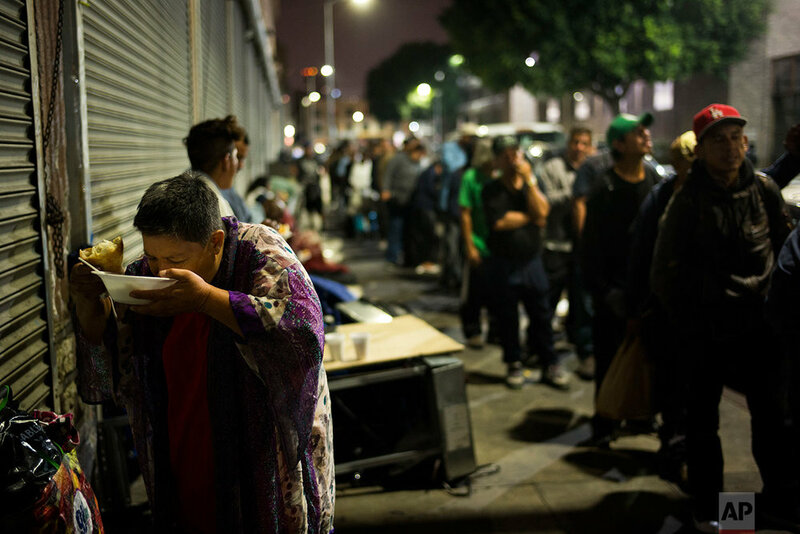 One night this week, there were two long lines on the edge of downtown Los Angeles. My home will soon start to feel like Christmas as my wife starts decorating. There will even be Christmas on Skid Row, too. Well-meaning folks and some celebrities and politicians will dish out meals. Blankets will be given as gifts. I hope they do more than just cover up all the suffering. Text from the AP news story, AP photographer shares experience documenting homelessness, by Jae C. Hong. See AP's coverage of the West Coast homeless crisis here.